Chicago Mayor Rahm Emanuel listens as President Barack Obama speaks on behalf of Emanuel during a campaign stop in Chicago, Thursday, Feb. 19, 2015. President Barack Obama met with Chicago Mayor Rahm Emanuel Monday during the World Series champion Chicago Cubs' visit to the White House, capping off two terms of a close relationship between them. Emanuel, a former White House staffer in the Clinton administration, was named Obama’s first chief of staff in November 2008 after winning his own reelection to U.S. House of Representatives earlier that month. He ultimately resigned the seat in January 2009. During Emanuel’s time as chief of staff, the future mayor was a key player in the passage of the president's namesake healthcare reform act. Emanuel reportedly pushed for a scaled back version of the law to gain bipartisan support, according to the New Yorker. In a June 2012 interview with the Chicago Tribune, Emanuel admitted that his instincts about the measure were wrong. In September 2010, Obama announced that senior advisor Pete Rouse would be named chief of staff to replace Emanuel, who was stepping down to run for Chicago mayor. 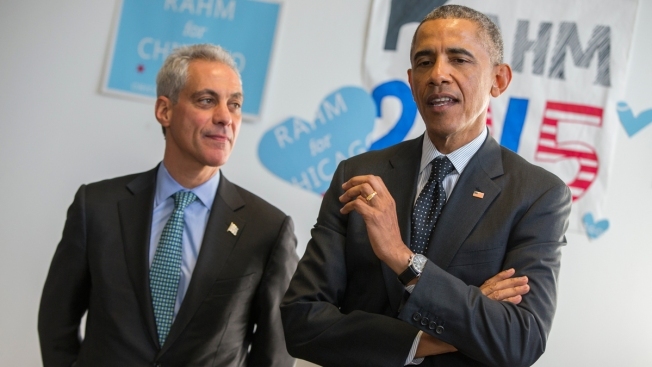 Emanuel won his 2011 mayoral campaign, as well as a 2015 reelection bid, which Obama personally endorsed. Just months after being reelected, the mayor faced a lasting controversy when dashcam footage was made public of the 2014 shooting of 17-year-old Laquan McDonald by Chicago police officer Jason Van Dyke. Protests erupted in Chicago, with demonstrators calling for the resignations of Emanuel, Police Supt. Garry McCarthy and State’s Attorney Anita Alvarez. McCarthy was ultimately fired by the department in December of 2015, while Alvarez lost her 2016 reelection bid to Kim Foxx. Through the controversy, White House Chief of Staff Denis McDonough defended his predecessor on Meet the Press last January, claiming Obama was still confident in the mayor’s leadership. Last August, Emanuel and other city officials announced that the Obama Presidential Center would be built in Chicago’s Jackson Park, signaling a continued relationship between the mayor and president. “This is a unique opportunity historically and a unique opportunity and I want to make sure the entire city of Chicago, specifically the South Side of Chicago, benefits from the once-in-a-lifetime cultural and educational investment,” Emanuel told reporters at the time. In his farewell address at Chicago’s McCormick Place last week, Obama puctuated his ongoing message of hope. Before the speech, Emanuel posted a video to YouTube commemorating the president's time in office. “Thank you for eight great years,” Emanuel said. "Thank you for your dedication to this country and thank you for the dignity and integrity in which you brought to the office of the President of the United States."